November’s official birthstone is topaz. Topaz occurs in a beautiful array of colors including shades of yellow/gold, pink, light green and blue. The rarest and most prized colors are referred to as "precious topaz" and are pinkish orange to reddish orange. The light blue color is more common and the result of irradiation and heating. Its name is derived from the Sanskrit word "tapas" meaning "to shine" and also implies "fire". Topaz is said to empower its wearer with beauty and intelligence. Topaz is an 8 on the Moh’s Hardness scale. It is a mineral composed of aluminum silicate. 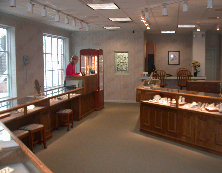 It is a popular gemstone because of its varied and beautiful colors and reasonable prices. 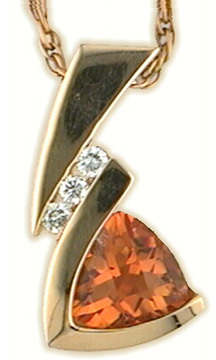 Care should be taken when wearing this gemstone because it exhibits a characteristic known as perfect cleavage - struck in the right spot, topaz can split in two. Also, topaz needs to be kept out of steam, heat and ultrasonic cleaners as color may be affected by heat. An alternate birthstone for November is citrine. There is an abundance of this gemstone which is the yellow variety of the quartz family and that makes for an attractive price. Citrine ranges in color from pale yellow to dark orange. The name is derived from the French word "citrin" meaning lemon. Citrine was once thought to protect its wearer against various evils - from snake venom to wicked thoughts - and to promote good health. It remains a prime gem for those seeking inner peace. Citrine is also associated with cheerfulness, youth and vitality. Citrine rates a 7 on the Moh’s Hardness scale. It can be cleaned in an ultrasonic machine but steam cleaning may be risky. It is best to clean in warm, soapy water using a small bristle brush if necessary. Citrine stands up well to daily wear. The primary source of both Topaz and Citrine is Brazil.